Adam was first drawn to acupuncture through the benefits he experienced as a patient, and his appreciation of the practice has only deepened since. Adam loves the fact that his work allows him to help people reduce pain, recover from disease, improve their quality of life, and optimize their sense of well being. He has a passion for women’s health and is well versed in many gynecological issues, such as polycystic ovary syndrome (PCOS), premenstrual syndrome (PMS), menopause, menstrual irregularity, pregnancy, and infertility. Adam’s approach is holistic; he evaluates both surface symptoms and possible root causes. By looking beyond isolated aspects of a person’s health and seeing how they fit together as a whole, Adam helps his patients achieve sustained wellness. 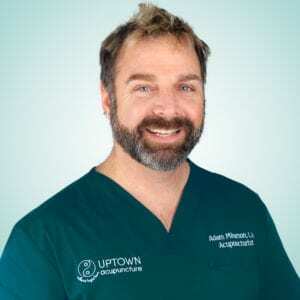 Adam is the founder and owner of Uptown Acupuncture LLC. Education, Training & Certifications: Adam is a licensed acupuncturist in the State of Maryland and the District of Columbia. He earned his Diplomate of Acupuncture from the National Certification Commission of Acupuncture and Oriental Medicine (NCCAOM), and he graduated with his Master’s of Acupuncture and Master’s of Oriental Medicine from the Maryland University of Integrative Health – MUIH (formerly the Tai Sophia Institute).